How does the Nexus 7 2 stack up? Google is out with a new version of the Nexus 7 tablet, and it's a refresh in every sense of the word. It's running an updated operating system (Android 4.3), it's slimmer, it's sharper, it's packing 2GB of RAM ... and the improvements don't stop there. But even with all the upgrades, is this version of the Nexus 7 enough to win over the TechRadar team? We've weighed what there is to know about the latest entrant on the tablet terrace, and gathered our knee-jerk scores for you right here. Oh man, this is a nice tablet. Let's review. Super slim bezel: yes please. Full HD screen: GOD, YES. Snapdragon S4 Pro? Take me now. Android 4.3: … well, we can start with that and talk about Key Lime Pie later - right, Google? Can the iPad mini look anymore overpriced? Starting the new Nexus 7 off at $229 (about £162, AU$270), Google has really lowballed Apple. 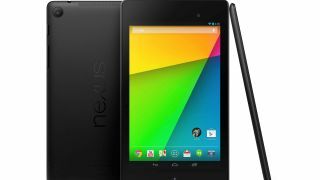 Since the iPad mini is still sans Retina, the Nexus 7 has the better display for a lot less money, and while Apple still has the stronger tablet ecosystem, all that could change. Adding things like Tablet 101 to the Play Store could really help highlight the best tablet optimized apps, which has never been Android's strong suit. I'm also wondering why anyone would want a Kindle Fire HD now. For just $30 (about £19, AU$32) more you can have a device with way more functionality, thanks to features like the new tablet enhanced Chrome. Unless you plan to only consume media on the device, I see little reason to buy Amazon's tablet. I have to say, I did scoff audibly when the Google rep called the Nexus 7 an "ultimate gaming machine." No offense to Riptide GP, but playing an uprezzed version of WaveRace 64 in the park is not my idea of "ultimate gaming." It could be an ultimate reading machine though. That light weight and pixel dense screen will make it easy to toss in a bag and whip out to consume a quick chapter. I was a huge fan of the Nexus 7, and this new update looks immense. Improving on a great screen is always a good move, and the power updates will really please the spec fans. Android 4.3 is massively underwhelming, but who cares when there's instant updates, low cost and a huge re-focus on media? I'm sold. As a current Nexus 7 user, I am pretty biased but the new Nexus 7 specs are glorious. Managing to beat the iPad mini's display and be a whole lot cheaper than Apple's device means that it has a decent chance of owning the seven-inch market. I'm a little disappointed that the bezel is still a little big, though, but the addition of decent sound and the promise of better gaming means that what niggles I do have are minimal. For me, the new Nexus 7 is all about the screen. The fact it got to Retina on a 7-inch before Apple makes it impressive from the outset. Watching Netflix in 1080p on something that's less than 300g? Yeah I'm on board with that. And if the iPad Mini 2 isn't retina then Apple's going to have a lot to answer to. But can we please stop putting rear cameras on our tablets? I've been avoiding tablets like the plague for awhile now because I'm old-fashioned and prefer keyboards. Oh yeah, and they're pretty dang pricey (lookin' at you Apple). Plus I have a smartphone, why would I need a tablet?